Homemade mayo. It’s become a bit of a staple in our house. I know not everyone loves mayonnaise, but I swear homemade is a game changer. It takes about 2 minutes to make & tastes significantly better than most store bought versions. & then you can quickly throw together a delicious crab salad or some spicy mayo dip. Trust me on this one – it’s really simple. I generally eyeball the ingredients & it turns out great, so don’t worry too much about exact measurements. If anything you want a little more oil than less. Use any mild-tasting oil for this. I generally use light olive oil because I find regular olive oil has too strong a flavour. Many people like avocado or macadamia nut oil too. Experiment & figure out what you like best (or just use the light olive oil – it’s great!). 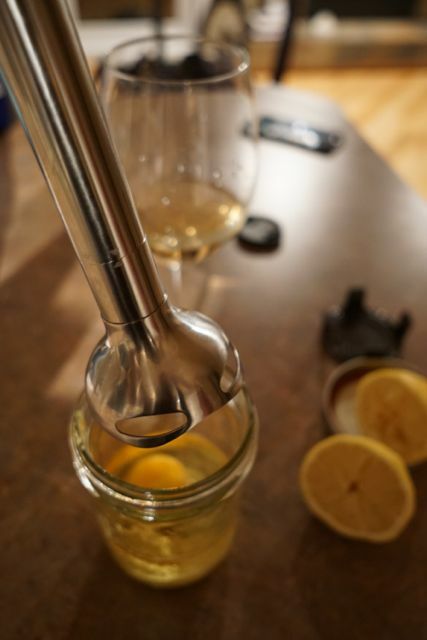 Throw all your ingredients into your mason jar & put your immersion blender to the very bottom of the jar. Fire up your blender! Keep it at the very bottom to start, & slowly raise it as it starts to emulsify. If it doesn’t seem to thicken to the right consistency (think thick, but spreadable), add more oil & repeat the process with the blender & the mason jar. Fifteen seconds in, it should look like the photo above. 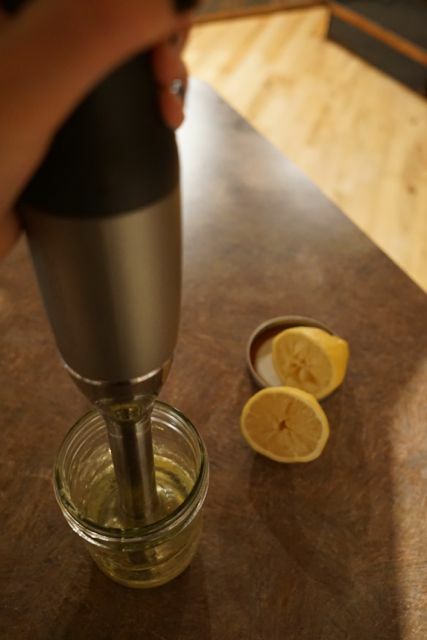 You can still see a little bit of oil at the top, so you can slowly start to raise the blender so that it mixes with the rest. Our finished product is always a little more on the yellow side because we use those Omega 3 eggs. It tastes delicious though. Add it to crab meat with a little hot sauce, celery, & dried seaweed for some quick midweek lettuce wraps – that’s my favourite use for this stuff! Experiment with different oils – each will add a bit of a different flavour, so you may have to play a little to find the one you like the best. There’s some debate about how long this mayo keeps for. I usually keep mine a little over a week, since I make it in smaller batches as I need it, but I’ve also heard it’s good until the date on the egg you used. I like it a lot better than most mayo’s I find in the stores (with one pricey exception I sometimes give in to) & it’s easy & cheap to make with ingredients you’re likely already buying. Have you ever made your own mayo? Is it something you’d try? I’ve never made it but I keep meaning to! I like the taste of homemade way better than store bought so I need to give it a try.